Steep grade. Engage 4-wheel drive. If you love to explore the outdoors, you’re plenty used to seeing these kinds of signs—the sort of warning that the abandoned logging road you’re trying to steer your subaru down might be of the axle-breaking variety. Or that you’re pushing up into the part of the high mountains where winter regularly extends through June. But you don’t expect to see a sign like this on the sole road leading to one of Hawaii’s most fabled black sand beaches—nor one of its most verdant valleys, cradled inside 2,000-foot tall vertical cliffs, with a gentle river winding through lush farmland. These kinds of destinations are usually pretty easy to get to, and, consequently, overrun with tourists. 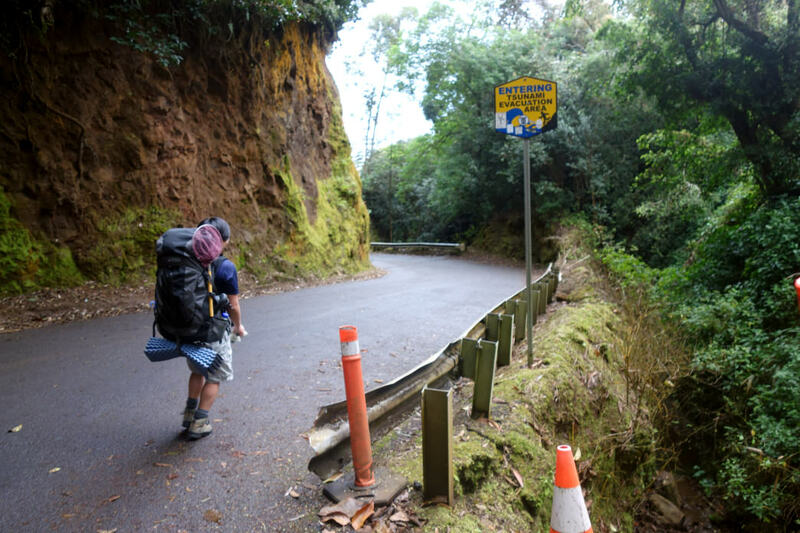 But the Waipiʻo Valley is no ordinary tourist destination, and the path to get there is no ordinary stretch of road. This is the steepest road in America—boasting an average grade of 25%—with certain sections that are graded as high as 40%. There’s a guard posted at the top who provides maps and friendly advice to visitors and prevents reckless drivers (AWD won’t cut it here) from taking a potentially fatal trip. And on the far side of this road lies one of Hawaii's greatest natural paradises. Sure, there have been attempts to make the valley more accessible. The military briefly had an outpost at the back of Waipiʻo after the Pearl Harbor attack of WWII. For a few short years the residents enjoyed a paved road and access to electricity. But Mother Nature caught up with attempts to modernize the valley: on April 1st, 1946, a massive tsunami—the biggest in Hawaiian history—wiped out all signs of progress, leaving the valley deserted for many years. Not wanting to tempt fate (or perhaps just liking the valley best in its isolated state), today’s residents have done all they can to stop the valley from joining the 21st century, and that includes keeping their valley as inaccessible as possible to tourist traffic—at least of the automotive kind. But there is still a way to get to the valley floor, even without a 4-wheel drive vehicle: you can walk. Now, that might be easier said than done, even for the young and fit. Walking down a 40% graded slope feels more like walking down a vertical wall then a pleasant stroll to the beach. 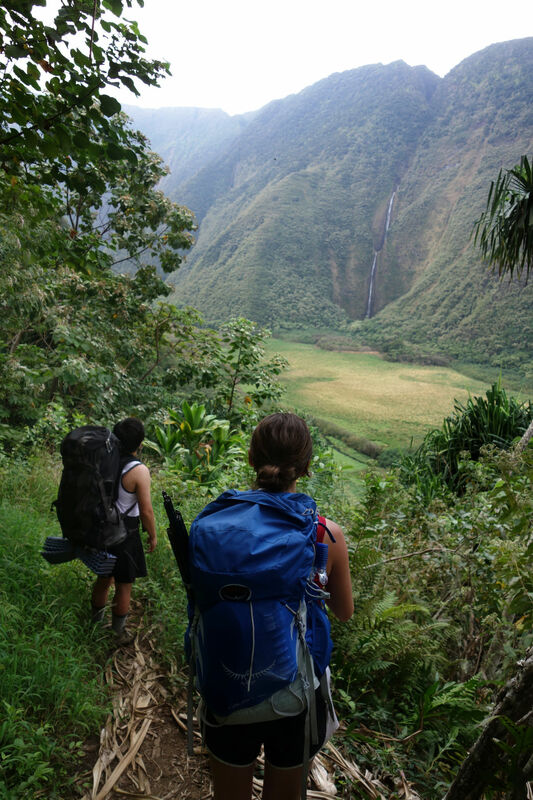 It would not be overkill to bring your trekking poles. Or Ibuprofen. Take small steps, and take your time. After all, you’re going to have to walk up this thing again, so you want to arrive at the bottom in reasonable shape. Once you hit the floor of the valley, there will be a fork in the road. 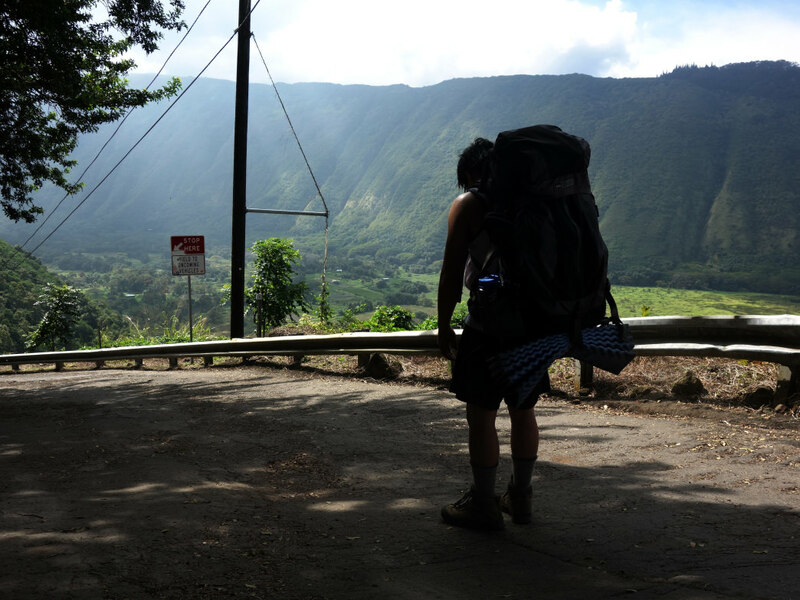 Veer left for the lookout point up to 1,450-foot tall Hiilawe Falls, the tallest on the island. 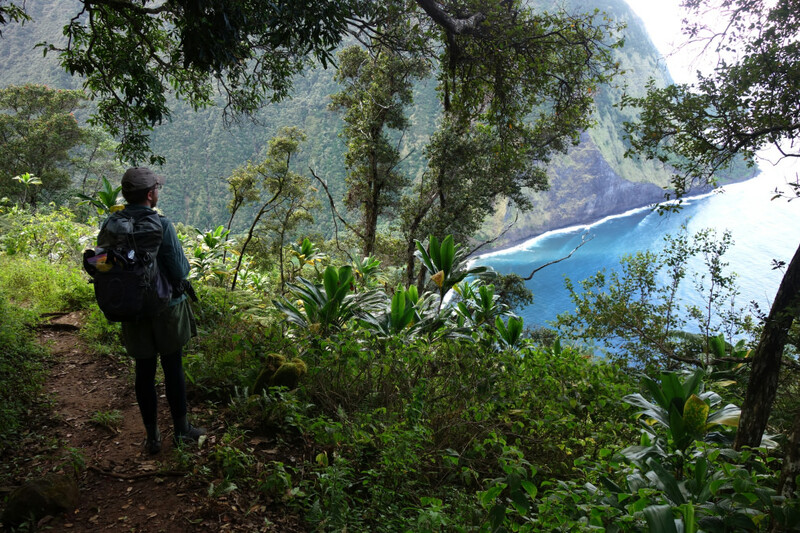 Admire the view from here, but go no closer, as the handful of full-time Waipiʻo residents (taro farmers, fishermen, and a handful of hippies) are notoriously reticent of outsiders trespassing. And you can’t really blame them. 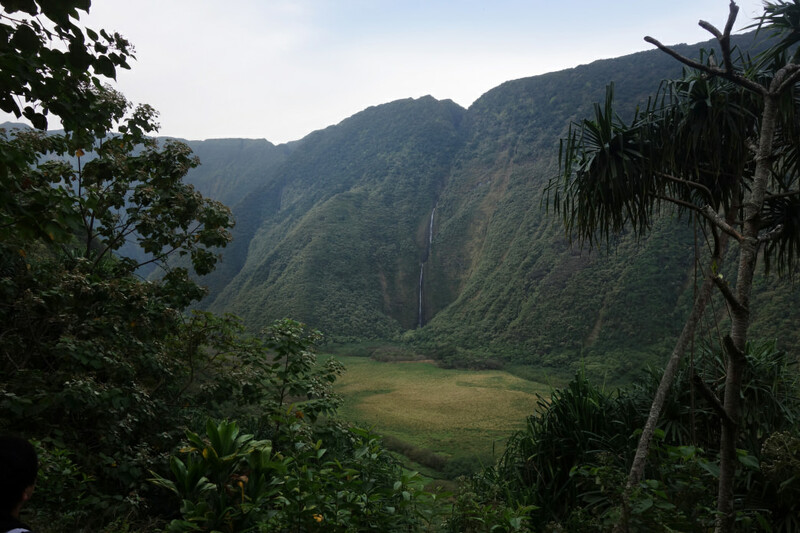 Waipiʻo Valley is a place of supreme importance in Hawaiian history. It was the childhood home of the first king of the islands during the 18th century, as well as its spiritual and cultural heart. Back then, it boasted a population of nearly 10,000 and it was widely believed that the farming output of Waipiʻo alone could support the entire population of the island. The Hawaiian Islands’ most important temples (heiaus) were located on the shores of the ocean and its kings were buried directly into the cliff walls surrounding the valley. Head back to the intersection and continue down the road to Waipiʻo beach. The road here veers to the left, following the shore past a number of unusual mounds—the graves of the ancient Hawaiians who once lived on the island. You can choose to walk along the road itself, or follow the black sand beach, separated into two parts by the Waipiʻo stream. A day spent relaxing here would be well-spent, but if adventure continues to call, cross over the river and hike the road to the start of the Muliwai Trail. As you hike, keep an eye out for wild horses—survivors of the 1965 tsunami—who roam the valley at will. A mile climb up this trail will offer spectacular views of the valley from the opposite direction. 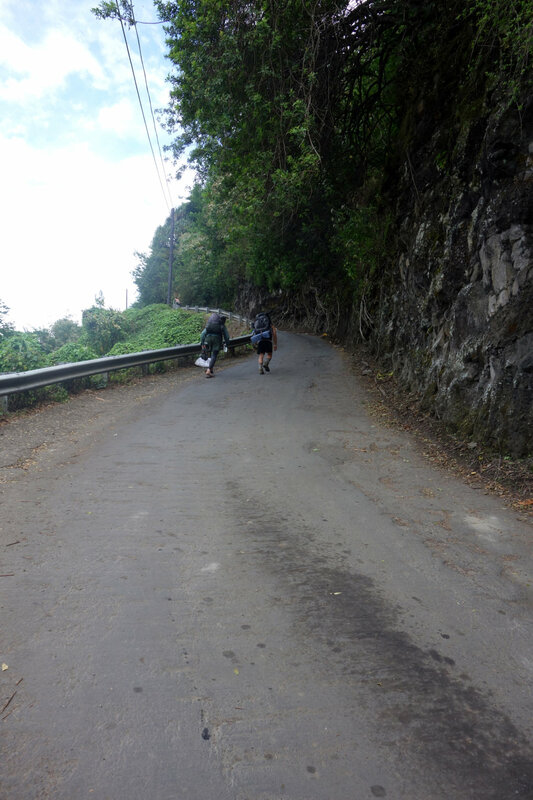 You’ll also get a chance to check out the steepness of the road you hiked down. If you’re looking for a softer adventure, you can skip the hiking altogether and arrange for a shuttle service to take you into the valley from the Waipiʻo Valley Artworks in nearby Honokaa. You’ll earn fewer bragging rights, but also more time on the beach and less time worrying about your knees. You can also arrange for a tour of the valley itself with a local, an ethical way to explore its rich cultural life, and hidden natural treasures, without disturbing the valley’s residents. For those that do choose to head down to the valley floor on foot, give yourself plenty of time to make it back to the top—and don’t be afraid to say no if a friendly local offers to give you a ride.